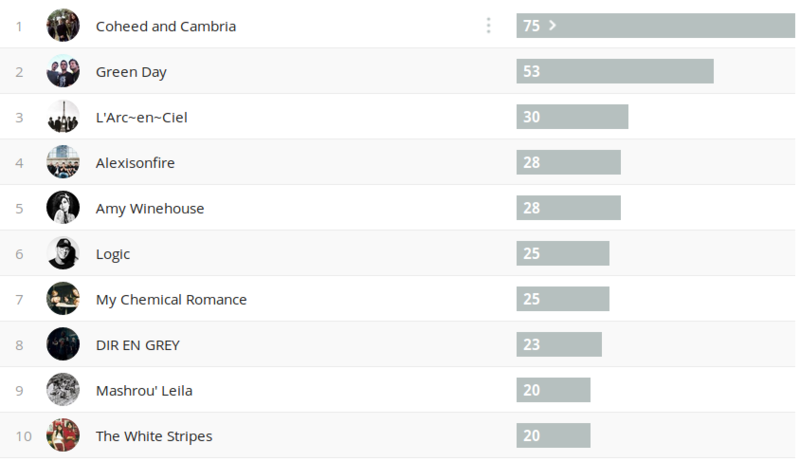 Coheed and Cambria (-) Still reigning as the top artist. 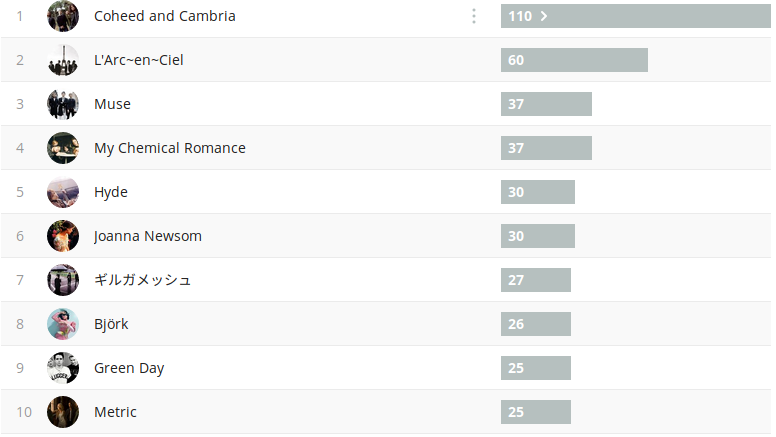 I’m terribly bad at not listening to Coheed and Cambria. I haven’t even been listening to the new album, really. I’m actually quite afraid of overplaying the new album. L’Arc~en~Ciel (+) The lead singer of L’Arc~en~Ciel, HYDE, released a single recently. 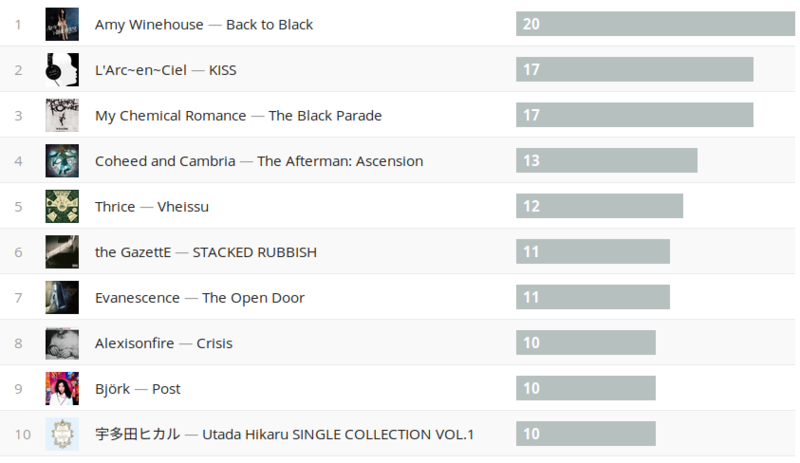 It made me super duper nostalgic and I went ahead and listened to a lot of L’Arc~en~Ciel songs. I decided to listen to one of their latest concert DVDs as it’s been a while since I’ve listened to one of those. Good stuff. Muse (+) I used to be part of a server of a friend’s and originally it was a lynch (a Japanese rock band) fangirl server but it slowly devolved to Bowie and Muse. There have been a couple songs that I’ve liked from Muse but it’s only until now that I’ve listened to more of their songs. 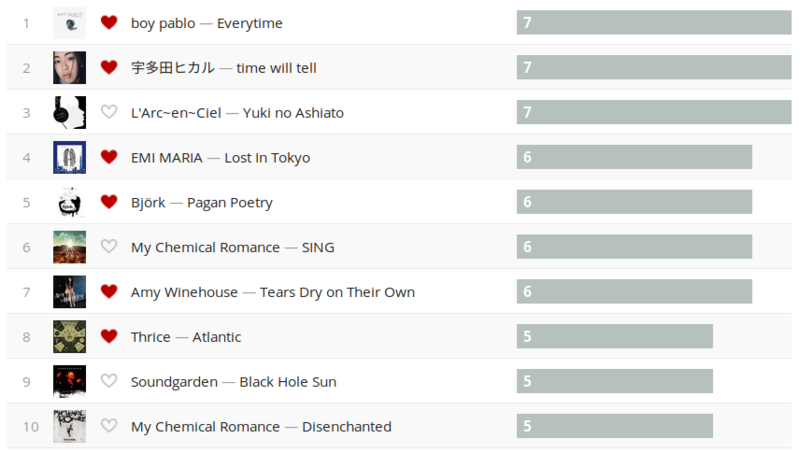 My Chemical Romance (+2) Similar to L’Arc~en~Ciel, the lead sing of MCR, Gerard Way, released a song recently. It makes me long for the days of MCR. 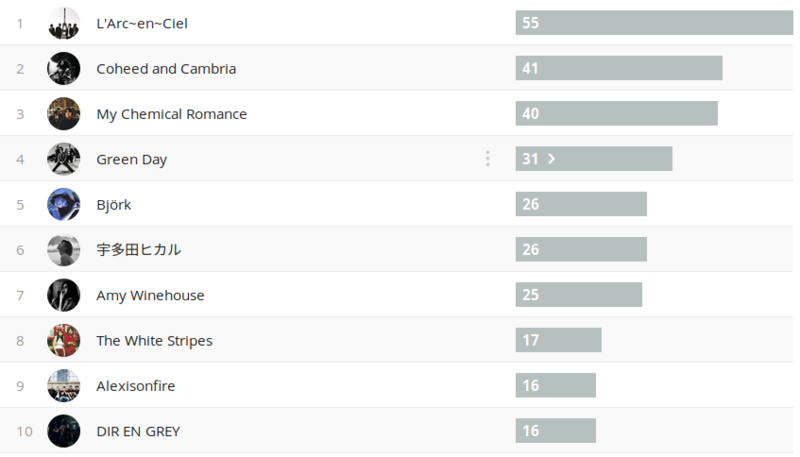 However, this was definitely a case of shuffling my library and MCR holding a good chunk of my library. HYDE (+) HYDE’s new singles are very VAMPS/666 era-like. I won’t complain because I feel like rock is thriving in Japan thanks to musicians like HYDE BUT OH MY GOD WHAT I WOULD DO FOR A ROENTGEN PART 2. I know that whatever genre Roentgen is isn’t really mainstream or commercial but it is a beautiful album. But I do like HYDE’s other albums too. Joanna Newsom (+3) I recently imported Spotify songs into foobar2000, the music player I used to use all the time before Spotify came around. So I can easily listen to more Joanna Newsom now, thankfully. I still have to listen to the Divers album. ギルガメッシュ (girugamesh) (+) Girugamesh is another band that takes up a lot of my library. I never really listened to them that much. They do have quite a lot of bangers, however. Björk (+) Björk AKA my queen. I am listening to quite a lot of oldies but goodies these past couple of weeks. Green Day (-6) How the mighty fall. I love Green Day but not that much. I definitely toned down on the Green Day. Metric (+) This is a result of my playlist repetition. 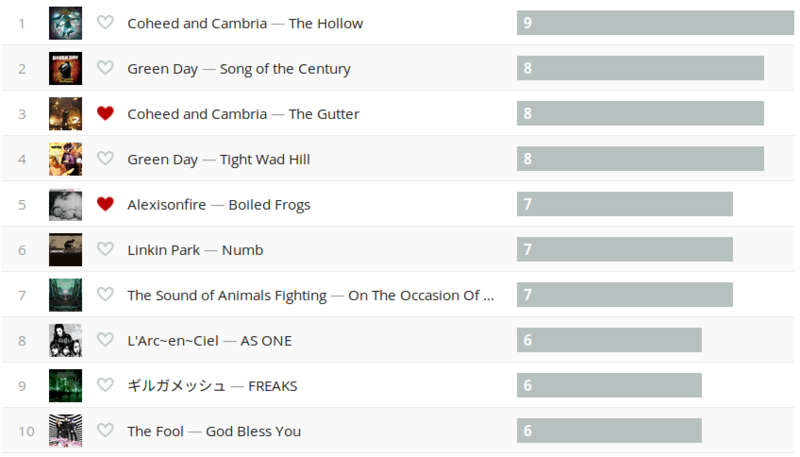 I have like three or four songs on my most heavily listened playlist. 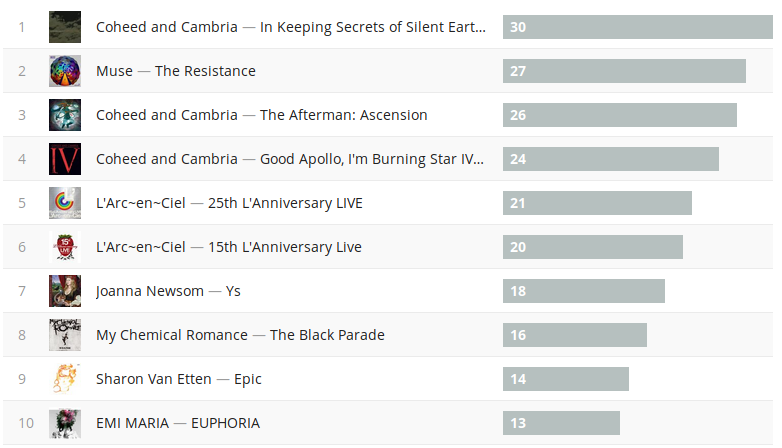 Coheed and Cambria — In Keeping Secrets of Silent Earth: 3 (+5) Curious. I’m surprised this is at number one. It’s not that many scrobbles, however. Muse — The Resistance (+) I listened to this album for the first time and it’s pretty good. I really like Muse’s sound. It sound futuristic and oh man, is it politically charged. I like it. 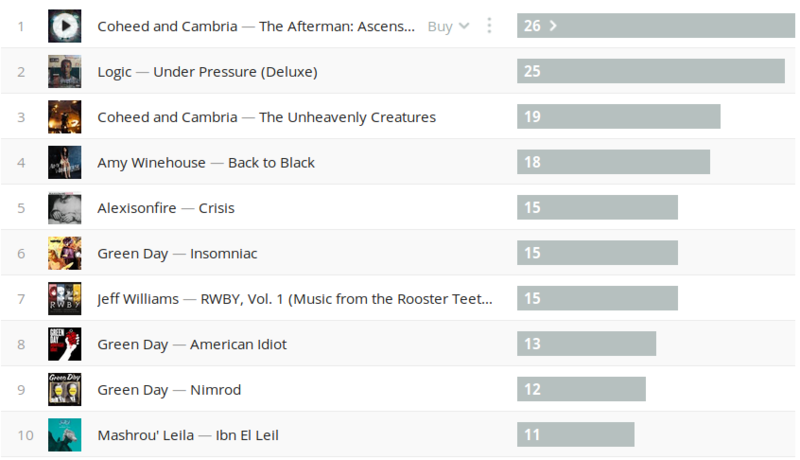 Coheed and Cambria — The Afterman: Ascension (-1) Still hyped about Coheed apparently. Coheed and Cambria — Good Apollo, I’m Burning Star IV: Volume 1 (+2) Yup. More Coheed! L’Arc~en~Ciel — 25th L’Anniversary Live (+) This album is long. This doesn’t even include “interviews” between songs. I just realized this setlist doesn’t have Flower in it. That’s so weird. L’Arc~en~Ciel — 15th L’Anniversary Live (+) In terms of quality, I think I like 15th more than 25th. 25th has a really diverse setlist but the concert was a lot more tighter and intimated in this L’Anniversary. Joanna Newsom — Ys (-) Joanna you beautiful songstress. I love you! My Chemical Romance — The Black Parade (+) Ah, yes, the emo bible for all emo kids back in 2006⁄2007. I loved this album so much. I’m not sure how much of it I still love now but it’s pretty good even now. Sharon Van Etten — Epic (+) I can’t keep away from this album, or rather, a couple songs from this album. 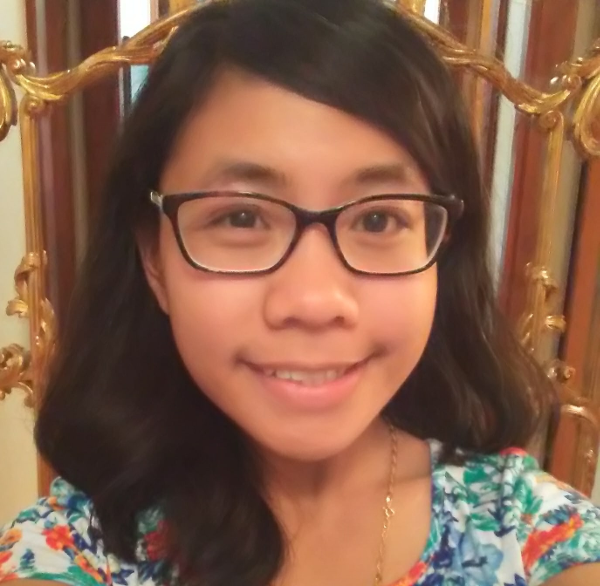 EMI MARIA — EUPHORIA (+) Oooh, this one is interesting. EMI MARIA is a half-Japanese J-pop singer. She’s a bit more innovative in her sound, which I like. Some of it is a bit outdated but I dig it. EUPHORIA is a solid album. Muse — Uprising (+) This song is so cool. I love the futuristic sounding synths. The guitar when it mimicks “come on!” is amazing. They will not force us. They will stop degrading us. They will not control us. We will be victorious. Coheed and Cambria — Domino the Destitute (+1) This song is still a banger. That is all. Coheed and Cambria — Crossing the Frame (+7) Good jam. I’m spying on you Newoooo. Frank Carter & The Rattlesnakes — Neon Rust (+4) Listened to this a little more compared to last week. Good song! Coheed and Cambria — No World For Tomorrow (-1) Still don’t understand how NWFT isn’t an absolute banger to some people. I love it. Sharon Van Etten — A Crime (-) I hope I never grow tired of this song because it is beautiful x2. I’m surprised this is still at #6 for the second week in a row. 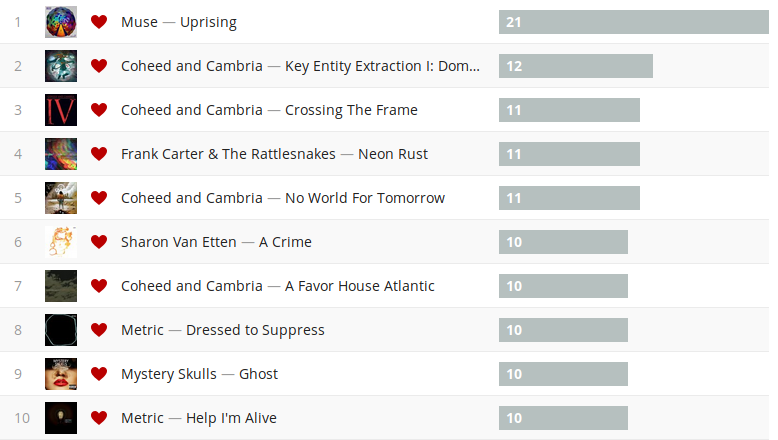 Coheed and Cambria — A Favor House Atlantic (-) Another song that hasn’t changed in ranking this week. Nice. Metric — Dressed to Suppress (+) I keep procrastinating on listening to Metric’s new songs and here I am, listening to their old single over and over again like a blob. Mystery Skulls — Ghost (+) This song is so catchy it’s dangerous. Coheed and Cambria — The Crowing (+) Instant chills on the first riff of this song. I do not know what Claudio is singing about in this song whatsoever. Pray you’re not the only one.